Although the venues seemed serene and calm, there was always a sense that something dramatic was about to happen. Why else would so much construction have taken place for an event that would only last sixteen days? It was just a year ago that the serious building began. Everyone wondered if all of the work could be completed on time. This is a photo of the first ironwork section of Olympic Stadium. It's easy to see why there was reason for concern. 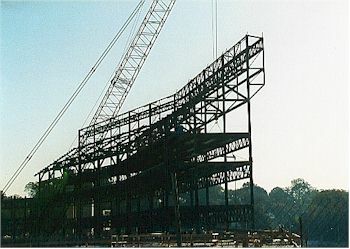 Although many venues, such as the Georgia Dome, the Georgia World Congress Center, the Omni, The Georgia Tech Coliseum, Atlanta-Fulton County Stadium and the facilities at the Atlanta University Complex already existed in the area, many had to be constructed from scratch. 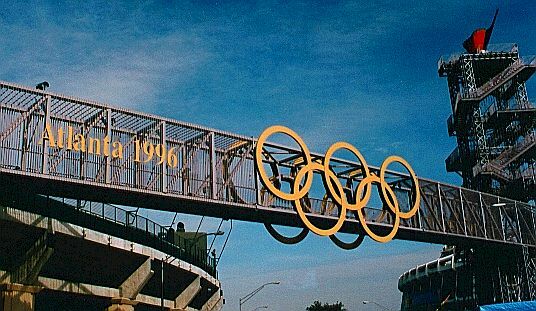 These included Olympic Stadium, The Georgia Tech Aquatic Center, The Clayton County Water Park (Beach Volleyball ), the Conyers Horse Center and the Stone Mountain Vellodrome. Also, the entire Olympic village had to be designed and built from the ground up! What an undertaking! All images copyright 1996 by Richard Weisser. Please email for permission to reproduce on your website.